SOG speciality Tools and Knives is renowned for their geared plier-based multi-tools, but as per previous installments of TPF-Online, they also manufacture some quality and interesting blades. With that being said, SOG gratefully provided TPF-Online with one of the Aegis line of knives for reviewing. For those that may wonder where the word Aegis comes from, let us take a bit of a history lesson from Wikipedia. An aegis is a large collar or cape worn in ancient times to display the protection provided by a high religious authority or the holder of a protective shield signifying the same, such as a bag-like garment that contained a shield. Sometimes the garment and the shield are merged, with a small version of the shield appearing on the garment. It originally was derived from the protective shield associated with a religious figure when related in myths and images. The wearing of the aegis and its contents show sponsorship, protection, or authority derived from yet a higher source or deity. The name has been extended to many other entities, and the concept of a protective shield is found in other mythologies, while its form varies across sources. The word Aegis has traditionally been used in defensive systems and designs across the world, from protective sunglasses to 1911 style handguns to ship based missile systems. It is in this vein of thought that SOG has adopted the name’s usage for an ultralight folding knife series. Based upon the patented SOG Assist Technology™, and the Arc-Lock system, the Aegis is very similar to the previously reviewed Flash-II in opening, locking, and safety mechanisms. 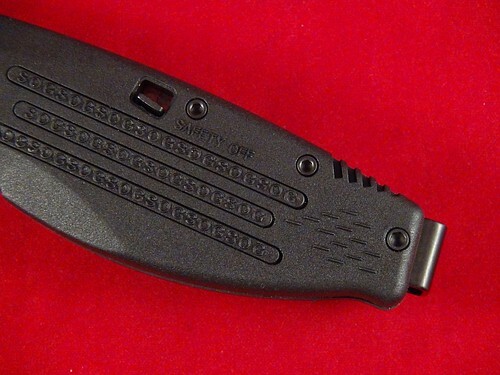 TPF-Online takes a look at the AE-04 model of the Aegis series of knives. The initial thought of the author when the Aegis was first looked at was that the handle looked cheap with a bland matte black finish and very minimal patterning for grip retention. Simply put however, the author was wrong. The black handle of the knife is manufactured from Zytel nylon and is composed of 2 halves secured together with six (6) socket head screws. Four (4) along the back spine of the handle, one (1) for the pocket clip, and final fastener as part of the SAT/pivot. The partially serrated tanto blade measures 89.0 mm (3.50″) in length and inserted into the blades spine are the ambidextrous thumb studs. The titanium nitride coated AUS-8 steel blade sports nearly 28.0 mm (1.10″) of thumb ridges along it’s 3.0 (0.12″) thick spine. The Aegis handle does differ from the Flash and it is these differences which externally show up between the two designs. The profile of the Aegis removes any excess thickness and width which was present on the Flash-II’s, such as the removal of the lanyard loop hole, two finger profile in the grip, and the small hump at the top of the handle above the pivot. The mass saved is offset by the tanto-blade profile which, while massing the same 97 grams (3.1 oz) as the Flash-II, results in the Aegis having a centre of gravity further forward than the Flash-II. In the grips are a series of rubberized inserts sporting the SOG brand name repeatedly while proving a surer gripping ability for the individual whom wields the knife. The manual safety on the left side of the grips and prevents the Arc-Lock system from moving the locking piston when in safe position. Since the piston lock also provides direct resistance for initial blade opening, by engaging the safety the piston is rendered immobile and therefore disables opening of the blade. Add into that the reversible pocket clip for tip-up carrying, and the Aegis package is complete. While SOG promotes this product as a tactical knife, the low mass and efficient blade design make the Aegis a good EDC knife for those interested. The SOG Aegis reviewed (AE-04) has a MSRP of $114.00 USD and is one of many variations available for the Aegis line of blades. Remember that the SOG AE-04 Aegis Folding Knife, like all SOG products, is backed by a lifetime warranty that protects against defects in manufacturing and materials. This knife can be found as various stores across Canada and online at places such as Toronto based www.thegreatoutdoorsmen.ca. TPF-Online authors have their own opinion of the Aegis folding knife, but ultimately it is your decision, the reader’s, to determine if SOG’s Aegis folding knife is Tactical, Practical, or Fantastical.